Make a statement with this Dragon Scale Ladies Purse! 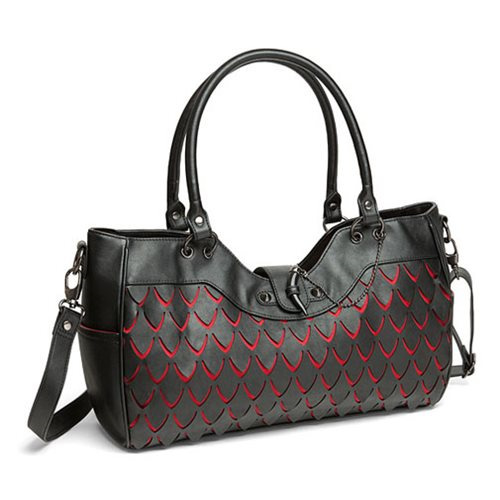 Made from black dragon skin, this purse features a dragon scale design and comes with a dragon fang closure. Depending on your adventure, this purse includes a removable cross body strap and handles so you can wear it different ways. Lined with red, the inside of the purse features 2 side pockets, 1 zippered compartment, and 2 pockets. Carry your valuables in style with this Dragon Scale Ladies Purse! Purse is made from faux leather and measures about 9 1/2-inches tall x 15-inches long x 4-inches deep. Ages 13 and up.